This class is designed for very young puppies, 18 weeks of age or younger at first class. This is a very important time in a puppy’s development and generally experiences at this age, both good and bad, will stay with them for life. Puppies at this age play together differently than older puppies (over 6 months) as by the time they reach 5 months they are already becoming adolescents. In this class your puppy will learn play skills with other dogs in a safe, supervised environment; the beginnings of basic obedience and the prevention of behaviour problems. In addition they will be exposed to new experiences in a manner where they will feel safe, including being handled by other class participants. As their guide, you will learn how to have a two way communication with your puppy and give direction effectively by marking and rewarding responses appropriately. It is a small size class for young puppies, aged 18 weeks or younger at the first class, with proof of their first set of vaccinations. This class is suitable for all dogs 5 months of age and older, whether they have just completed puppy class, are an adolescent that is being introduced to basic obedience or are a rescued dog of any age. Older dogs have also done well in this class. You will learn how to communicate effectively with your dog, understand them better and therefore develop a stronger relationship. The basics that are taught include: pay attention; sit; down; stand; stay; come from short distances; leave-it and learning how to walk on leash without pulling. You will also receive help with common behaviour problems such as jumping up and how to teach your dog to greet people politely. 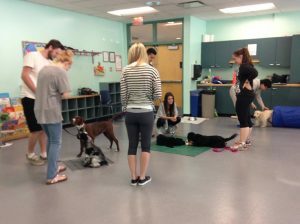 The class is taught using reward-based methods of training. It is a small size class with dogs on-leash. Proof of vaccination is required. Intermediate obedience for dogs that have completed Family Dog Manners or an equivalent basic obedience course. You will continue to build on the skills that you have already learnt as well as learning new ones such as: understanding where heel is; finish; back up and go forward when asked, increased difficulty with recalls and stays and working in closer proximity with other dogs whist paying attention to their handler. 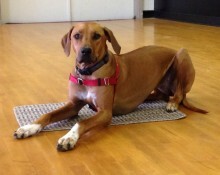 It is not a formal obedience class but rather taught in a manner that is fun for both you and your dog. If you are thinking of taking the Canine Good Neighbour Test or wish to work in Pet Therapy with your dog then this would be good class for you. Dogs may be off-leash for some exercises. Small class size. Proof of vaccination required. Step Beyond is not running at this time. Sometimes more individual help is needed for your dog. It may have difficulty focusing in close proximity with other dogs or maybe a specific behaviour problem has developed that is best resolved one on one. Whether you wish to brush up on basic obedience skills in a more private setting or wish to resolve a specific behaviour problem, then this maybe the best decision for you and your dog. Private lessons are also a great way to get off on the right paw with a brand new puppy before undesirable habits develop. All the basics such as crate training, bite inhibition, house training and some basic exercises like sit and settle are covered in one introductory session. Adoption of a dog of any age can be helped with a couple of private lessons. As you work with your dog, it will learn to trust you and help facilitate a lifetime bond. Private Lessons are available year round.